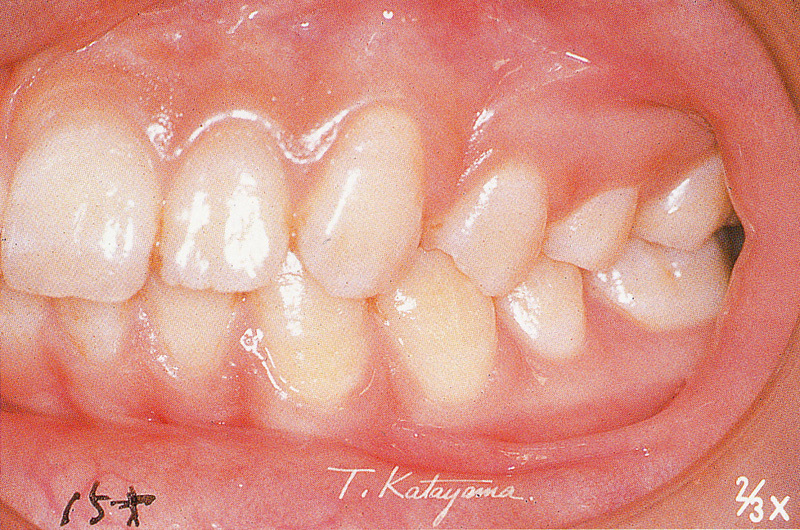 We must first know the standard of healthy gingiva of to judge having periodontium or not. Naturally you can judge by even bleeding and the depth of the periodontal pocket, but at first you must be able to judge it visually and sensually. Small hair pore spots ( Stippling ) exist all over. The color is light oink and the tone is uniform. She visited our dental office because of sharp pain after the wisdom teeth removal in other office. There was bleeding, and a sharp pain from gingiva. 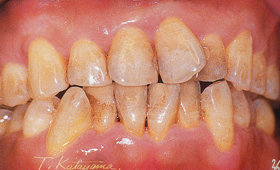 An oral hygiene state has improved through brushing instruction without causing pain and bleeding. Those symptoms disappeared after 20 days. 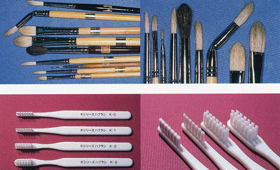 Establishment of the oral hygiene to precede all dental procedures was required during the period. She visited us for gingival bleeding during the eighth month of pregnancy. She improved an oral hygiene state through brushing instruction that taking long time with a softer and small toothbrush slowly not to have pain, and not to let her bleed. An explanation that bleeding and the drainage of gingiva affected the fetus became a big motivation. These symptoms disappeared after 22 days. 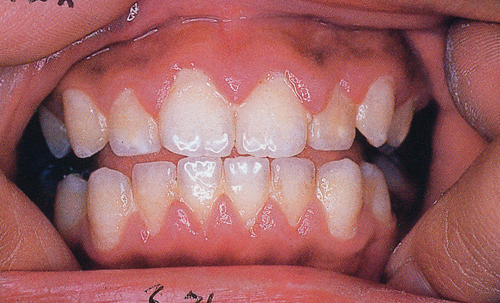 Conventionally, this symptom is named gingivitis gravidarum conventionally, and its cause depends on the change of the hormone balance, but the gingival symptom disappeared by the establishment of oral hygiene. We let her understand an effect of the natural good activation therapy (= Physiotherapy) and performed scaling, root planing and wished for a successful execution of mouth cleaning. 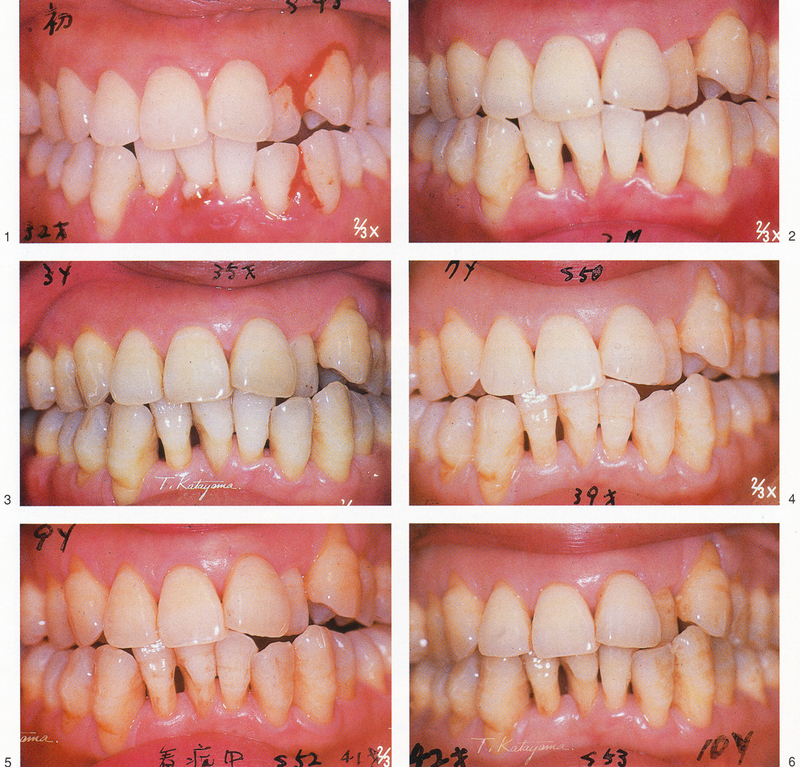 1 month later, the improvement of the gingival tissue was mostly seen. 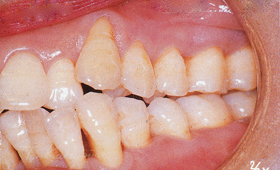 4 months later, most of the separation of teeth of mandibular was recovered. 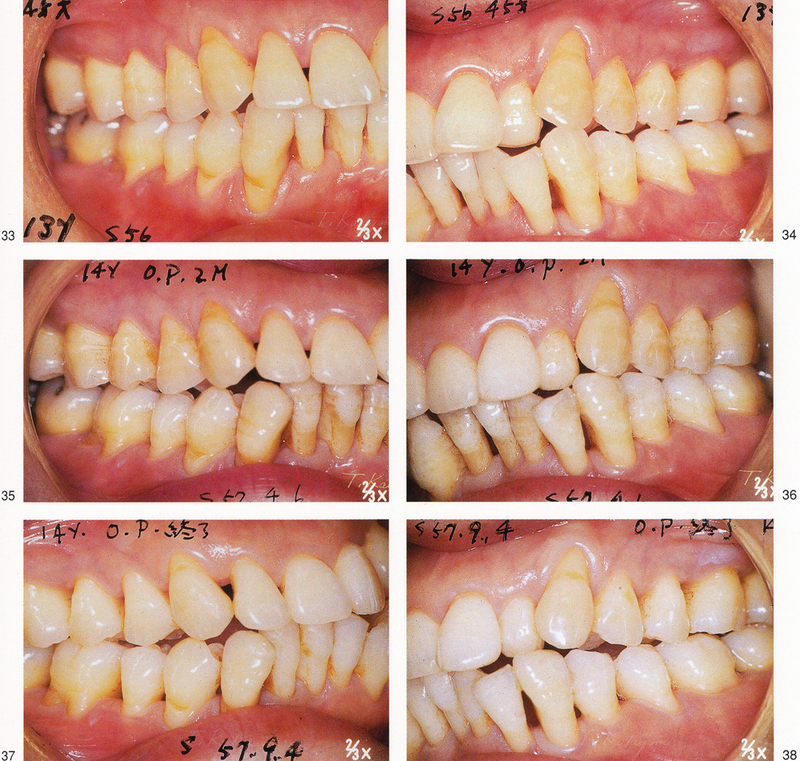 The gingival form became good and seemed to be able to secure gingival health maintenance. 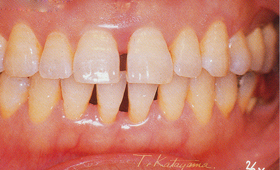 In the separation of teeth of the front tooth, there is the dental movement as the accompanying symptom of the gingival lesion. 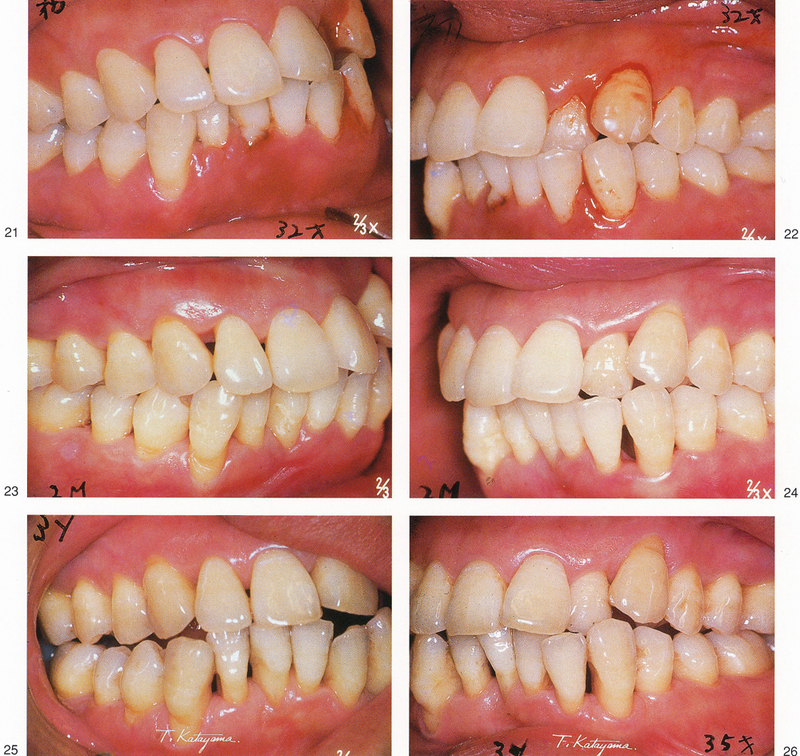 In that case, it is recoverd with the healing of gingival lesion. 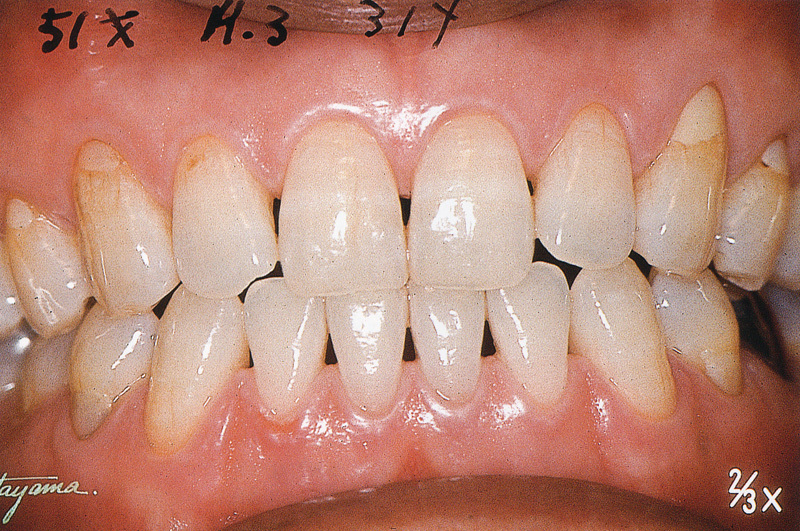 However, the state before the gingivitis onset remains after the gingival lesion recovery like the upper jaw of this case when it is patient's natural characteristic. 7ms.after the tooth contour correction. 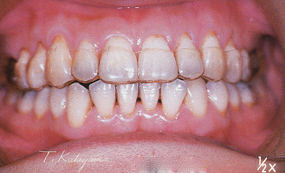 1ys.after the tooth contour correction. 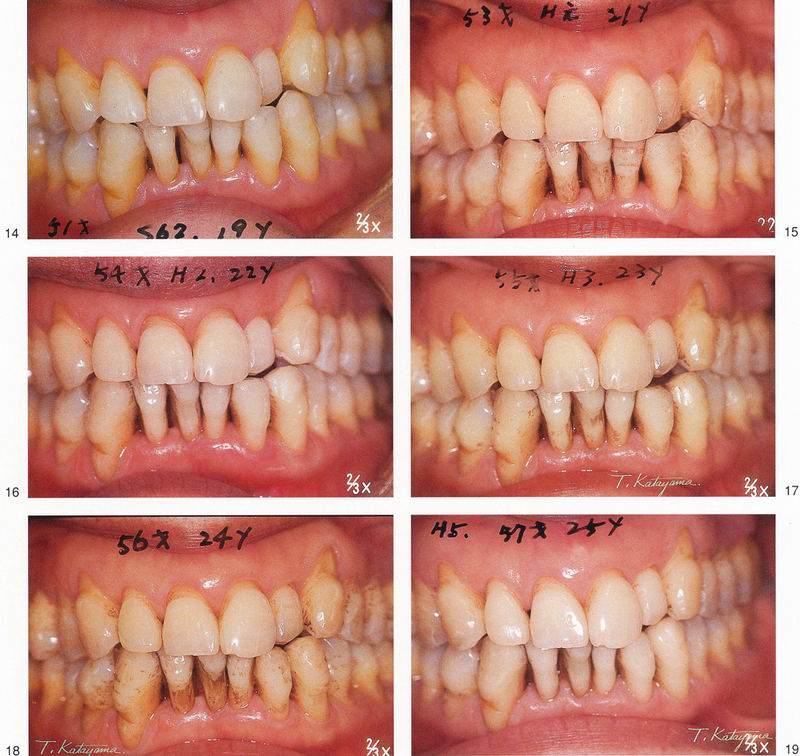 For several years, she had received gingival treatment at a neighboring dental clinic, but repeated the abscess formation 2 or 3 times a year. She said that she was very much careful about brushing. She finished a series of necessary courses including the natural good ability activation therapy (Physiotherapy) as required first action preparations. 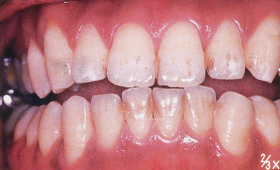 As a result of performing brushing more than 30 minutes a day, and furthermore brushing after dinner, the gingiva became in the form that was approximately desirable two months later. Three years later and seven years later there was a little absorption without a recurrence in the photographs, too. For a period of time, fatigue was serious due to the funeral and the nursing of old father, the gingival state turned worse, but she recovered without a grave mistake and lived for 14 years. She kept the livingry instruction such as eating habits improvement, the chewing method, the breathing method as a recuperation severely and received consultation voluntarily for a fixed period every three months. In the photograph three years later and seven years later, there is little absorption without a recurrence, too. An announcement was serious, and, 11 years later, the gingival state turned worse for a funeral secondary to nursing of old father at one time. However, it was recoverd without a gross mistake. She kept the livingry instruction such as the eating habits improvement, chewing method, breathing methods as as a recuperation closely and continue to receive consultation voluntarily for a fixed period every three months. I hardly perform an occlusal adjustment from the first medical examination for 13 years. 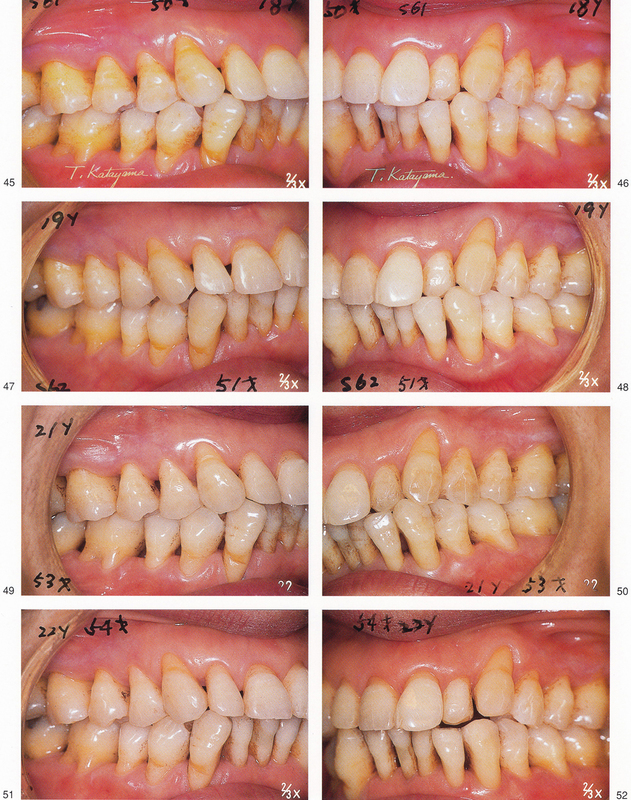 After 14 years, I waited until the livingry such as the medical treatment methods having colonized and performed a tooth contour correction for the first time. I revised an adjacency side and the tooth contours of faces, and the not crowded interdental space is corrected little by little by lips pressure, tongue pressure. I divided this into several degrees and carry it out. 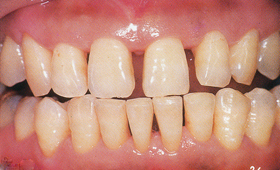 Her countenance changed without using a correction device by performing a tooth contour correction. The temporary splinting is the element which is important from the viewpoint of design, plan of the last prosthesis and the quality of life, and because the alveolar bone reproduction is promoted and the toothbrushing is carried out effectively and easily. 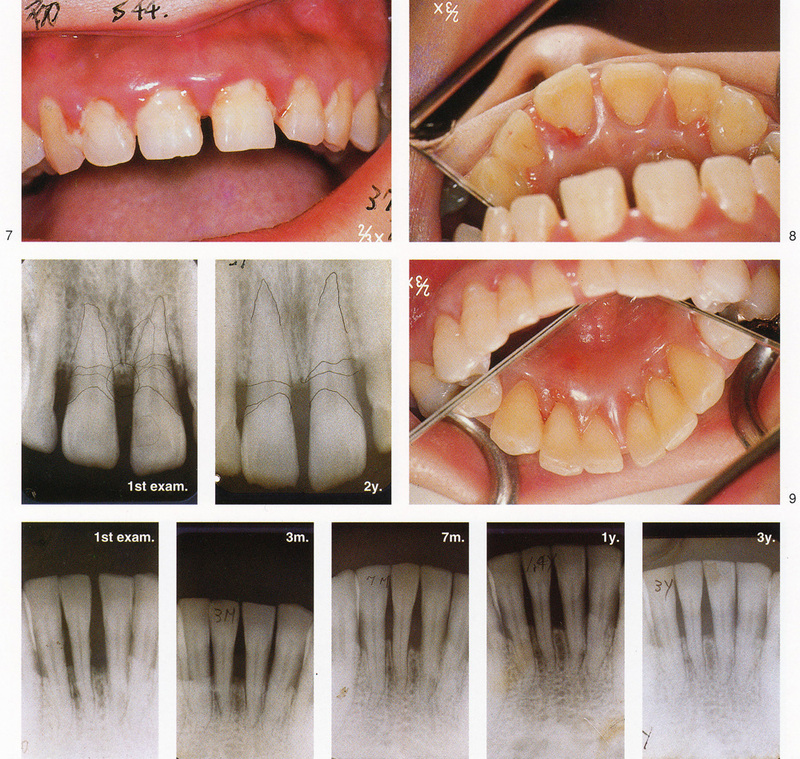 If we remove the cause of illness as initial preparation and can control regression, the aggravation of the alveolar bone, the form of gingiva and the alveolar bone is normalized without surgical care. In other words, we make it a practice of maintenance of the oral hygiene to a patient for the life, and we disperse the bite pressure and keep it in a burden limit by an interval or an eternal splint. Roll a wire alloy for clasp of 0.8-1.0mm in diameter with a roller and make an oval. Apply a resin separation agent to the surface of the model and tie the ligature wires to a continuous clasp in the interproximal parts. 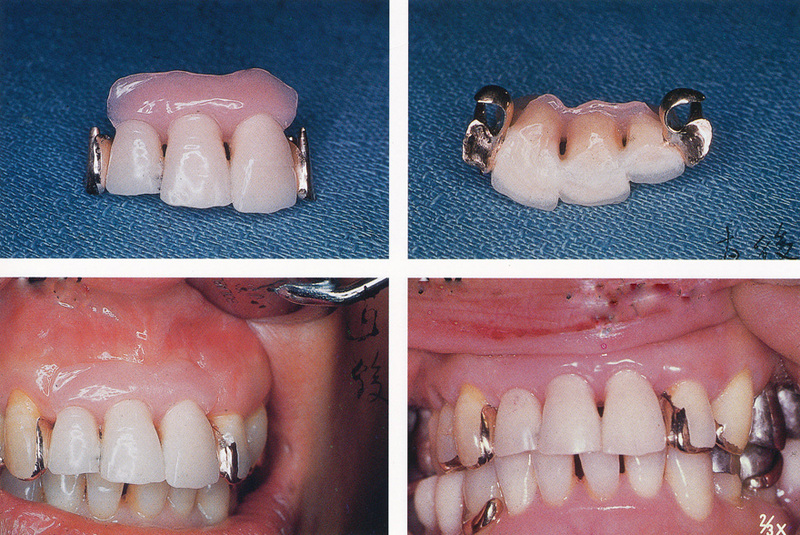 On a model, fix buccal side continuous clasp and ligatures with polymerization resin immediately. 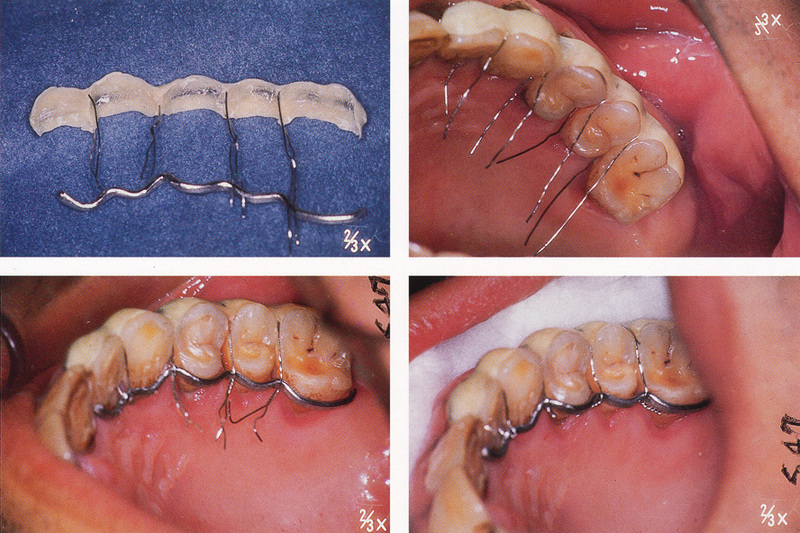 Fasten the ligature wires to the continuous clasp of lingual side. The relations of the clasp anchored tooth and clasp of the partial denture are discussed from two points of the maintenance of the denture and the maintenance of the clasp anchored tooth, and various kinds of denture retainers are devised. 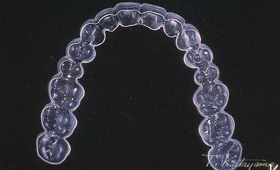 In general, when I attach a denture to a residual tooth infected with periodontal disease, it is normal that the clasp anchored teeth are connected and fixed, and a strong retainer is necessary for each other's stability. 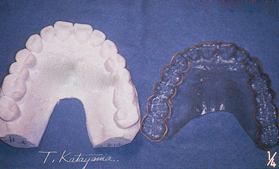 Katayama added a maintenance power and a fixation power of Pin and Tube appliance to Key and Key Way attachment and often used the homemade attachment with compound clasp or simple clasp. Besides, the rest part is like the Post Inlay type. (K.K.K. 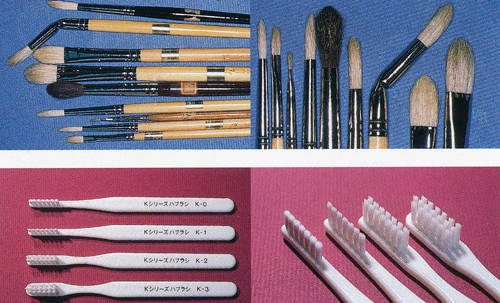 : Katayama-type Key and Key way attachment). Various inventions are done to carry out the point to keep in mind of the partial denture design that both cases explained earlier. 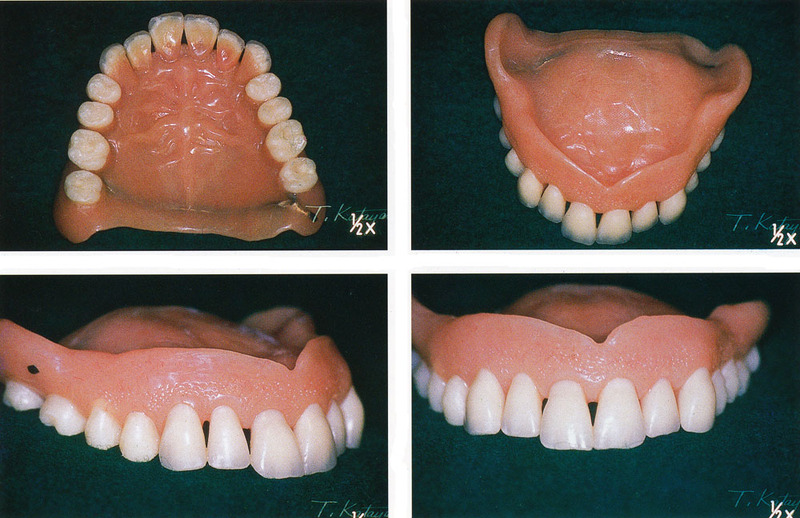 In this way, the denture which adapted to the residual teeth which are connected well plays the role of "permanent splint" as a whole. 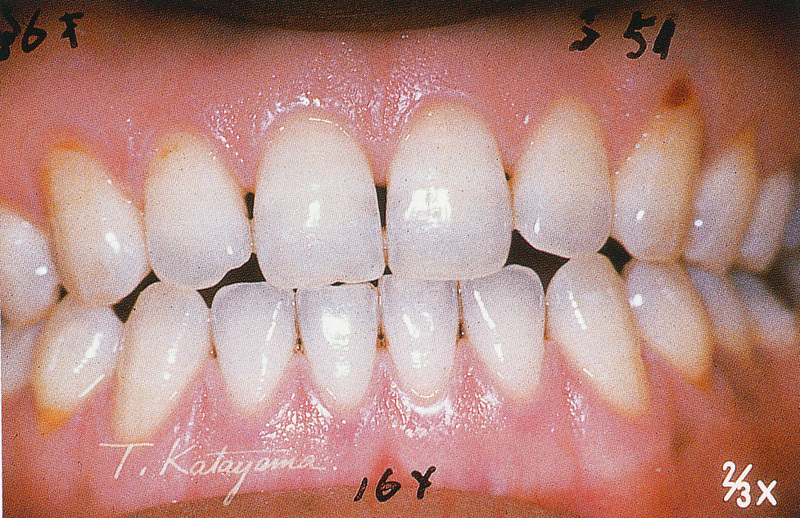 Katayama seemed to examine only a patient of pyorrhea, but there is the case of such edentulous jaw, too. 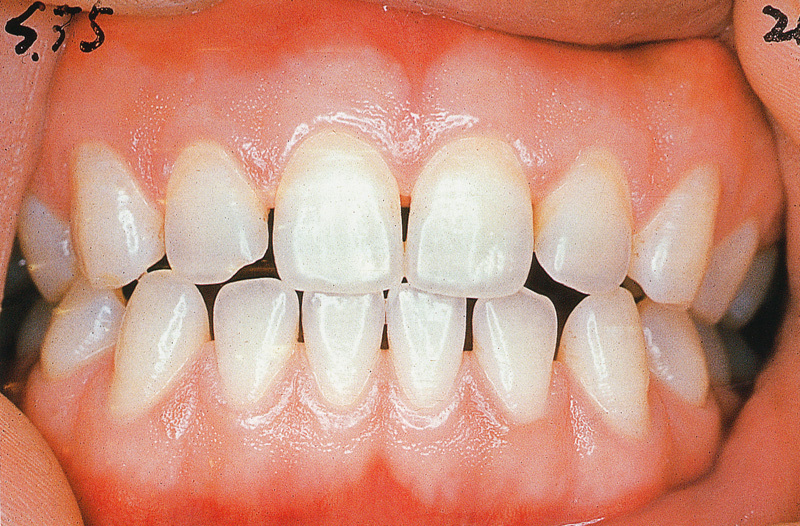 Register the exercise of muscular group with tender wax to copy a border and a gingival form. This helps the sequence of artificial teeth. After an occlusal adjustment, I let it perform grinding movement in the particle-formed small sand mud elaborately and do it in full balance. To keep cleanliness of the mucous membrane side of denture, I polymerize it with putting a film between a model and a mucous membrane side, and finish it on the smooth surface. I insert a wire in the rear of the denture to prevent transformation at the time of the polymerization and to raise strength of the denture. 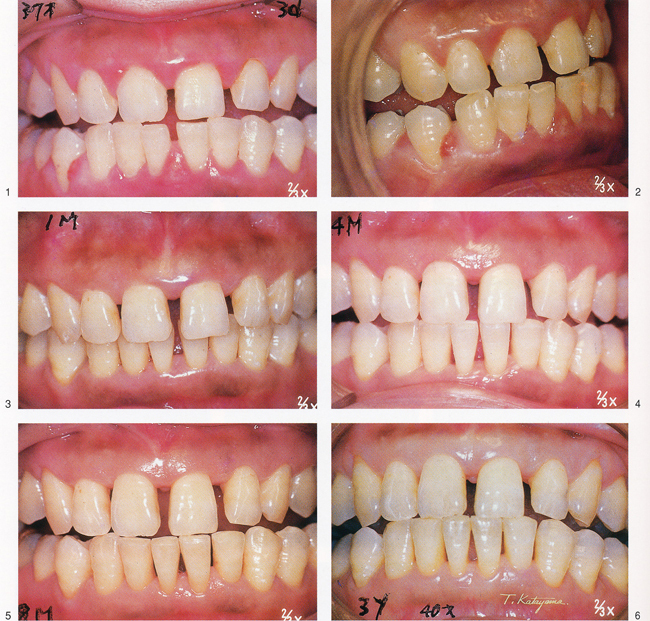 Marginal gingiva and stippling are given to the gingival department by an aesthetic point. I think that the adaptation range of the movement measures of teeth said to be Minor tooth movement is decided by the recognition of the dentist about the meaning of a word of Minor. In the clinical practice, it is performed as the measures that are necessary for the removal of sufferings from illness and the improvement of the condition every day, but the movement measures itself will be a measure not to seem to be the main hope of the patient. In other words, MTM should be enforced by the dentist’s thought what a kind of influence do the main complaint, the hope of the patient and the movement of teeth have on the treatment result and the understanding of the patient. When inflammation of periodontium is caused by various kinds of causes (most abnormal stagnation of the plaque), the teeth are extruded. It causes the premature contact and give the organization damage, and, as a result, the inflammation turns worse more (fig.1). 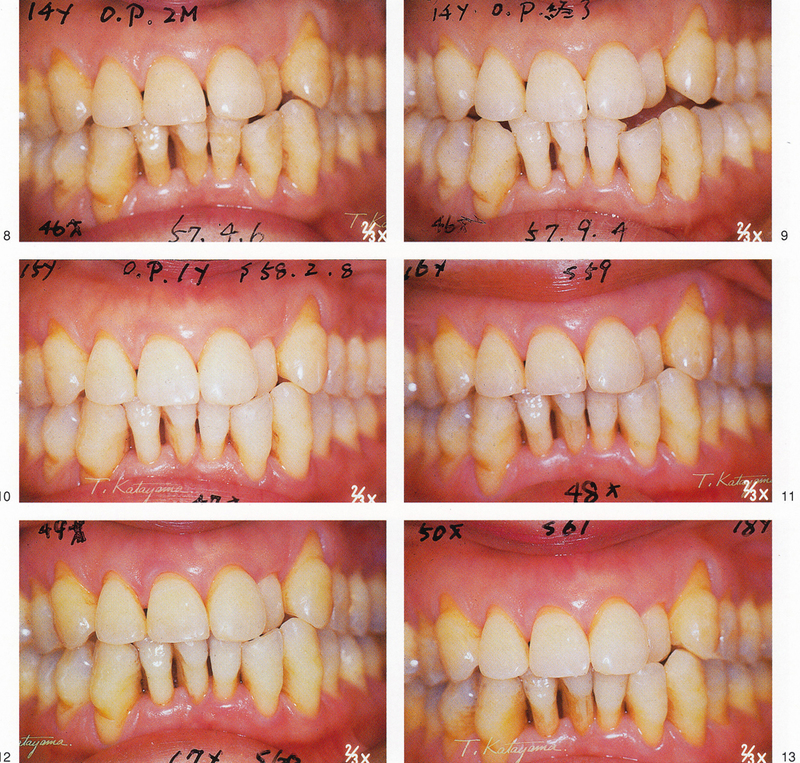 At re-first visit (16 year-old), I did the pulp capping with upper right 4 (toothache) of teeth of the main complaint and I expected the secondary dentin formation under the treatment of the pulp protection. Let him note a state of the periodontium; only as for the medical treatment instruction and the promise of the periodic examination. At the next time, an almost good state was kept , and it was admitted that the Diastema was restored and it disappeared naturally. With the progression of periodontal disease, it is hard to completely restore the alveolar bone which disappeared. In other words, the bite pressure is doubled and acts to a supporting tissue of the tooth root region destructively when bite pressure acts from the lateral side in particular because the crown-root ratio decreases. And it greatly affects a recurrence in the treatment and after the treatment. When normal force of mastication acts as strong flank pressure because of the malposition of teeth and admits that it continues acting for progress, the aggravation of the lesion seriously, you must perform that you normalize the flank pressure first. 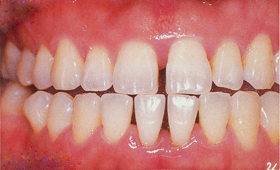 Therefore you should plan measures to return teeth to the normal position. This is a reason dealt with as initial preparation of H.M. Goldman. It is thought that most of the subsequent measures are invalid if I do not straighten teeth from a beginning with measures of the plaque . Probably, about time of the periodontal disease treatment, the case of most to visit the dental clinic with a chief complaint of periodontal disease, is earliest degree of P2. 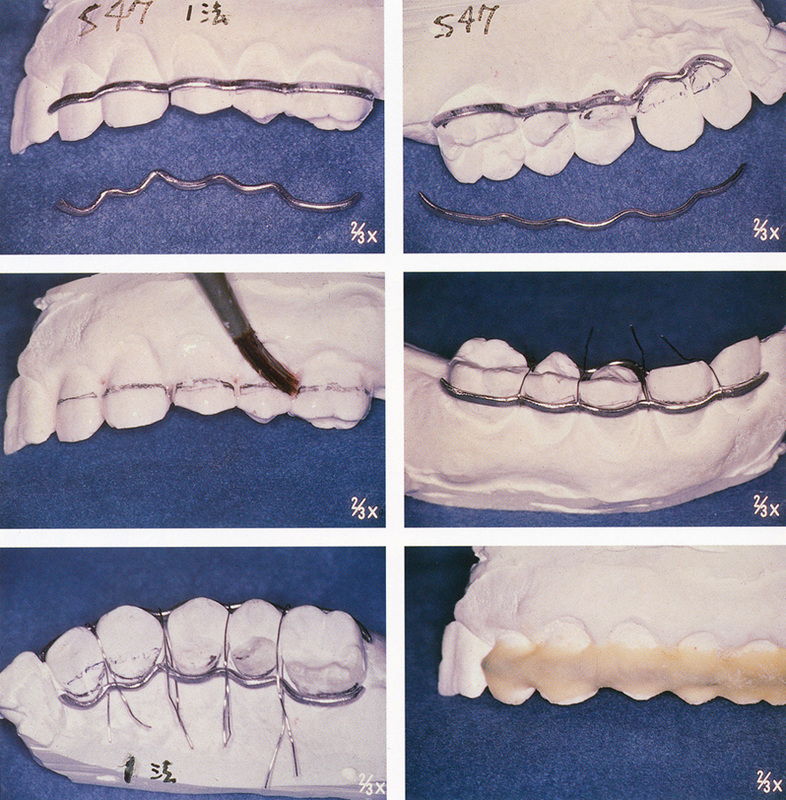 In addition, judging from a great many present condition swhen it progresses further, you must begin to return the teeth to the position right immediately if the teeth are in condition to strongly receive flank pressure. 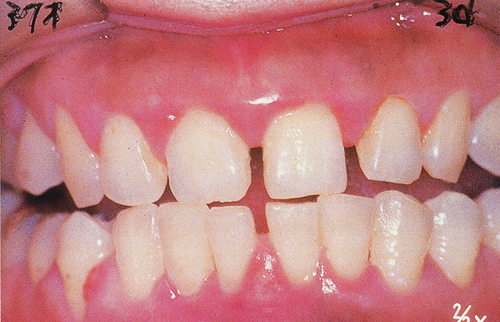 The 1~2 teeth causing anomaly of occlusion causes malposition just a little, and particularly many cases are malposition, elongation and extrusion of the tooth axis direction. 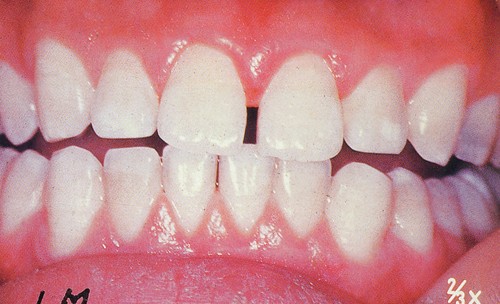 Therefore, Abnormality is raised in the adjacency department of the teeth, and there are extremely many cases to cause food impaction in either mesial or distal side. 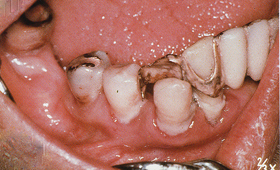 And inflammation is aggravated, and, the elongation and extrusion becomes clear consciously, and the bite pressure acts as flank pressure for a tooth axis, and morbid malposition becomes clear. If the patient gives teeth specific tongue pressure with uncomfortable sense, or there are other pressurs, the malposition becomes more and more famous. In this case we carry out the removal of the plaque of the cause thoroughly, and it is completely eliminated for no pressure no stimulation when there is food impaction. 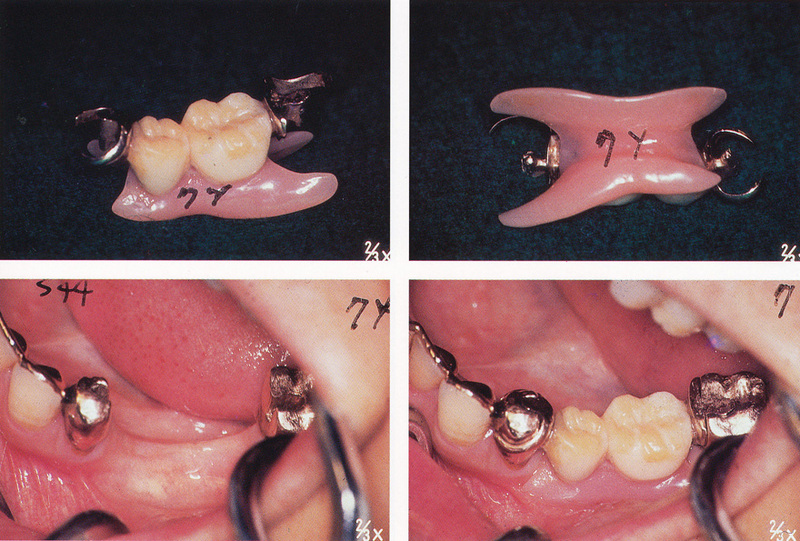 And it remits in a short term and recovers in normal condition by the measures to remove bite pressure and giving suitable stimulation for organization activation (fig.２). 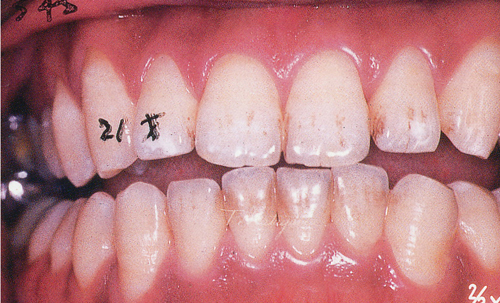 The Diastema disappeared with remission of the periodontium naturally. In order to avoid masticatory pressure, to grind completely the parts of premature contact, and to fix the temporary splint is often carried out in the state. 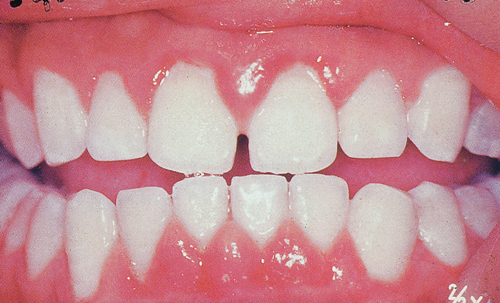 In this way, if we fixe the extruded tooth as malposition, and grind the parts of premature contact, it adversely affects a state after treatment. 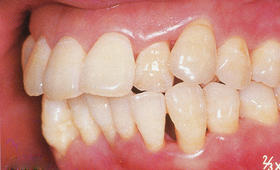 After having removed the splint, tooth movement begins immediately. 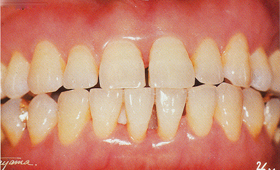 During the 1~2 night and day, I let a patient take in fluid food, half fluid food while reducing gingival inflammation by an enforcement of the appropriate brushing and do not give teeth a burden by force of mastication (the resilience increases it extremely early by avoiding occlusion in this way). In this case you should not perform to grind of the premature contact point as much as possible. The place done grinded will leave a gap for occluding relation after healing and must perform artificial recovery to satisfy this by all means immediately. When we make traumatic occlusion a problem, it is the case to cause the aggravation more and more by a traumatic occlusion state continuing . 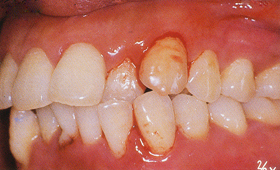 In this, you must be careful about the occlusion treatment by dentist becoming most causes in particular. 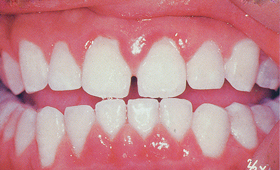 Generally, the malposition (malalignment) of teeth makes stagnation of the plaque easy. Therefore, in comparison with the normal dentition, a periodontal disease is easy to be caused, but it cannot be said that a person suffers from periodontal disease by all means. 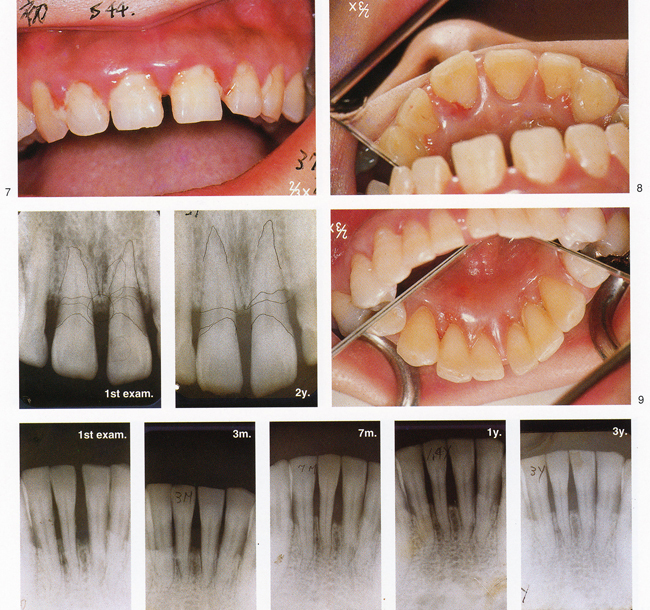 The recurrence is inevitable even if it healed without straightening malalignment, if a periodontal disease is caused for malalignment by all means . In other words, generally it is a mistake to cite malalignment as a direct cause of periodontal disease, and it should be said with one of the factors of periodontal disease. 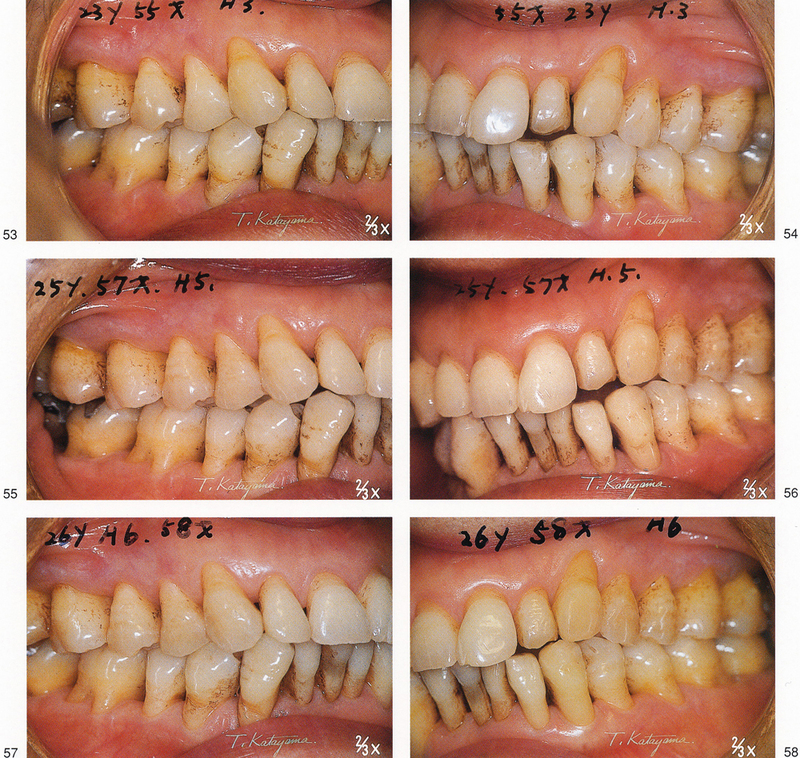 Bone resorption progresses, and the pocket depth is deep, but a good result is kept by scaling, the medical treatment enforcement of the brushing. 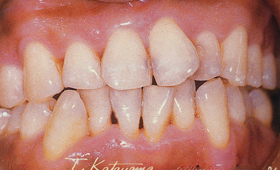 The good result cannot be seen as the injustice dentition if the cause of this disease is malalignment. 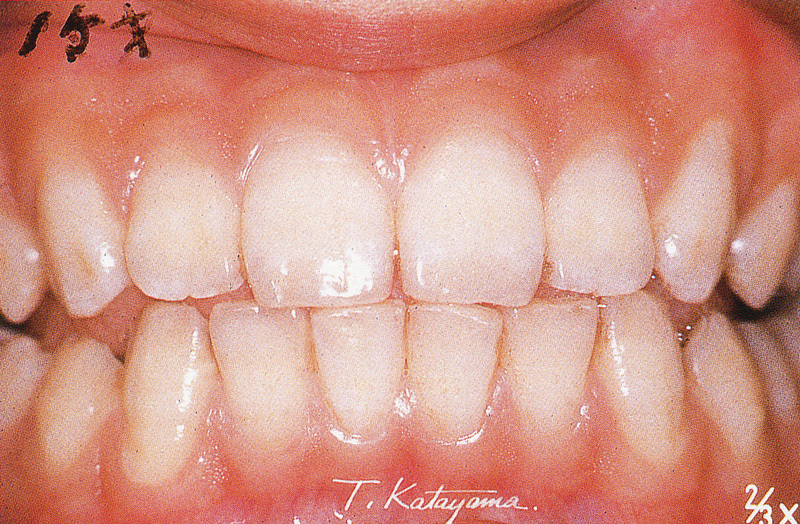 In this case, it is admitted that it is totally similar to a case of fig.3. his is because the reason why it performs M.T.M. 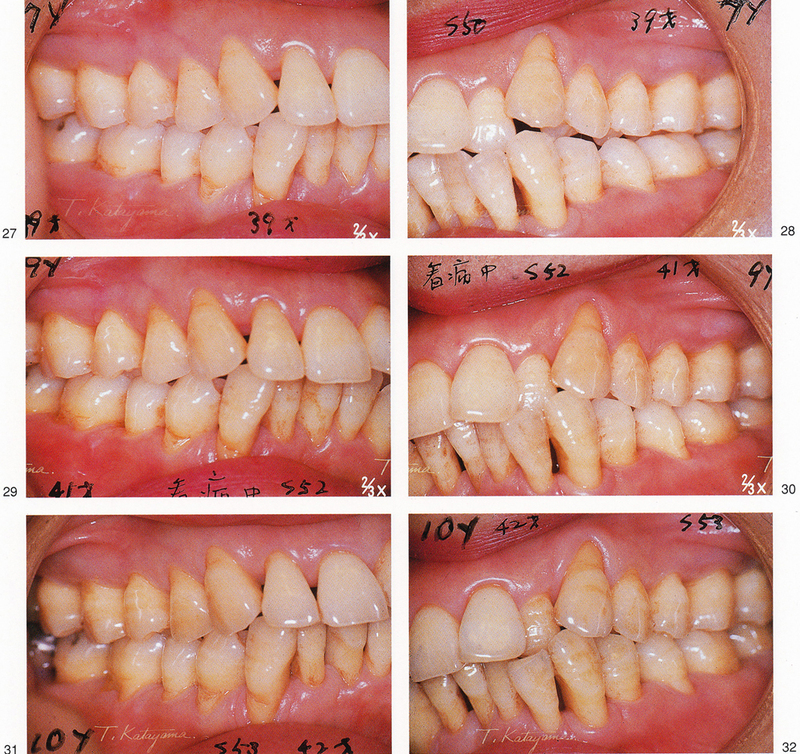 in the case of periodontal disease treatment is that it does not let pathogenic occlusion abnormality continue, and it returns it to the occlusion state before the periodontal disease onset. In other words, the curative effect of periodontal disease rather adversely affects it for the anomaly of occlusion when anomaly of occlusion is rather caused by correcting the malposition of teeth. 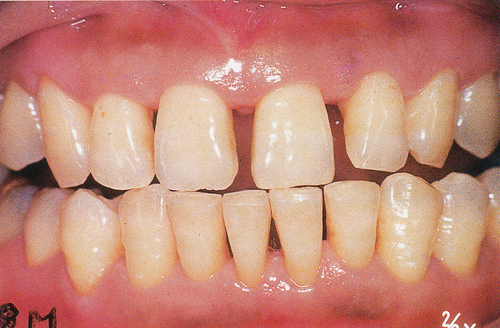 In this case we move the teeth while coordinating occlusion and cure malposition in an original state. However, the collapses of the occlusion are left in the place that we adjusted when we completed periodontal disease treatment. 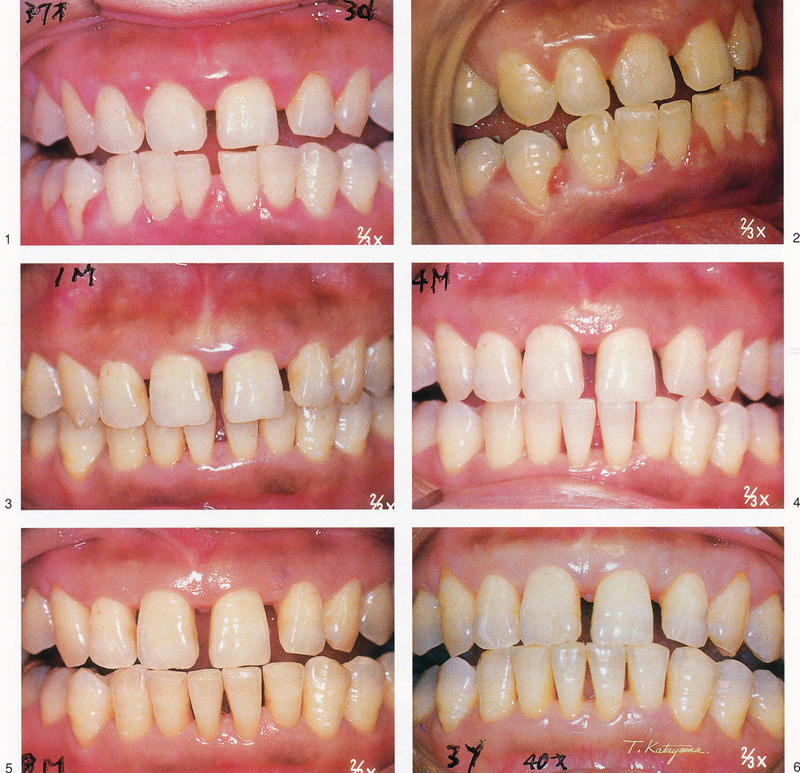 Therefore, you must restore occlusion by filling, inlay and others again by all means. When we finally need occlusion recovery by the eternal fixation, it may be said that one performing such M.T.M. is advantageous(fig.5). 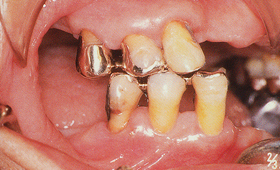 For mandibular front tooth part bridge damage, lower right 3 is transposed by labial, mesial side. After (M.T.M.) revising 3 positions, I put on an permanent splint. However, at first you prohibit occlusion with measures to hold down inflammation to the first and must take a way to avoid premature contact when an eternal anchor is not necessary. And when people carried out fluid food, half fluid food, they cannot avoid the occlusion contact under the unconsciousness during deglutition and sleep. Therefore, in this case, it is necessary to protect from biting force to inhibit recovery while attaching a guard possible of the disassembly, and performing bite raising. 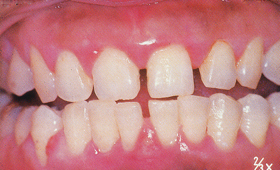 In the guard, I give only teeth in acknowledgment of anomaly of occlusion space necessary for recovery (fig.7). And I take off a guard and shift to interval fixation for a while when I accept normalization (premature contact having disappeared). The period is around one week at most. Premature contact recovery guard: I make room for movement of teeth with the premature contact and protect it from occlusion contact under unconsciousness such as chewing, the deglutition. 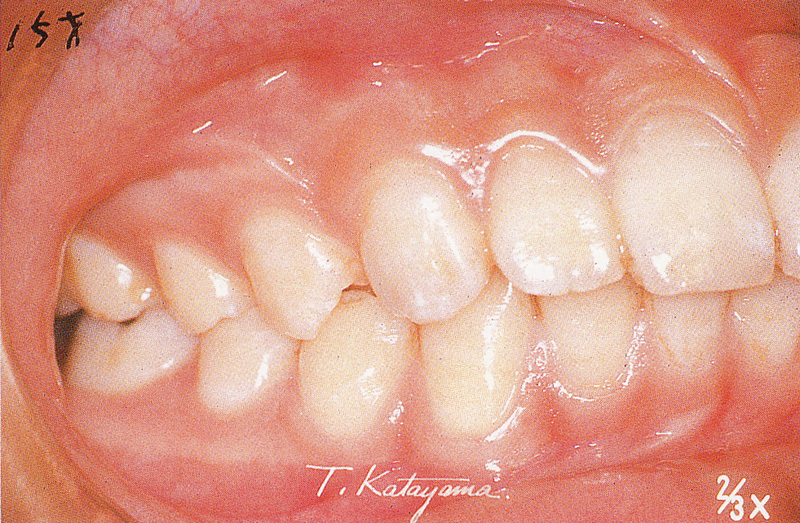 When it is such an abnormal occluding relation (most are such cases, and, ideal dentition and the ideal occluding relation are fantasies practically), early contact is caused for some kind of sudden pathology. The thing causing such a specific occlusion is, for example, to avoid the sharp pain due to the cavity, to makes up for disorder of the ability for occlusion by loss of tooth and to avoids the occlusion at the place after the malposition of teeth is caused by a periodontal disease. You must notice that these phenomena are caused. 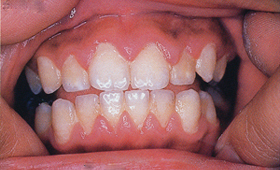 It is dangerous to coordinate the premature contact for such an anomaly of occlusion caused suddenly by grinding. Because of the occlusion imperfection by the both sides molar tooth part loss, perform the chewing at the front position a little, as a result, maxillary front tooth part had been separated. 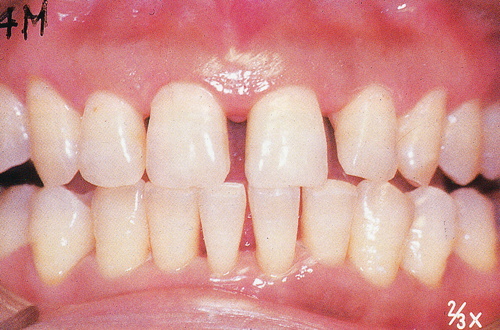 Occlusion was restored by the prosthetic restoration of the molar tooth part. Meanwhile, with periodontal disease treatment, as for the part to separate of the front tooth part, spontaneous recovery is accepted. I did not perform M.T.M. and grinding for occlusal adjustments at all. However, even in the case of such a sudden abnormal occlusion, the understanding and the agreement of the patient are necessary separately from the present treatment when we make an occlusal adjustment to enlarge the occlusion range that does not give occlusal trauma. 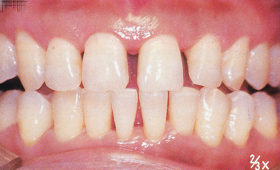 It is not so necessary to perform the malposition of teeth prior to periodontal disease treatment for the reason of harmonizing aesthetically functionally, and is hardly impossible again, and it may be said that it is a mistake from the above-mentioned logic and the results of the illness treatment. 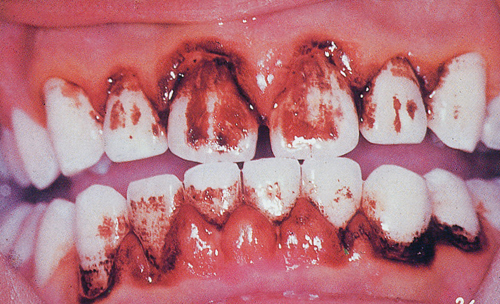 The first reason to correct dental malposition in the periodontal disease treatment is that it is thought that premature contact works as a serious interference action factor for prevention of treatment and recurrence. Therefore, this treatment must be provided by all means, but must be performed based on a precise policy carefully from a beginning. 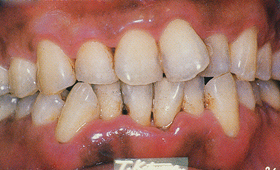 When lesion inflammation of the organization is fierce, you must avoid adding stimulation of a more tooth movement most. In addition, the range of the correction movement goes back up in a state before the onset. 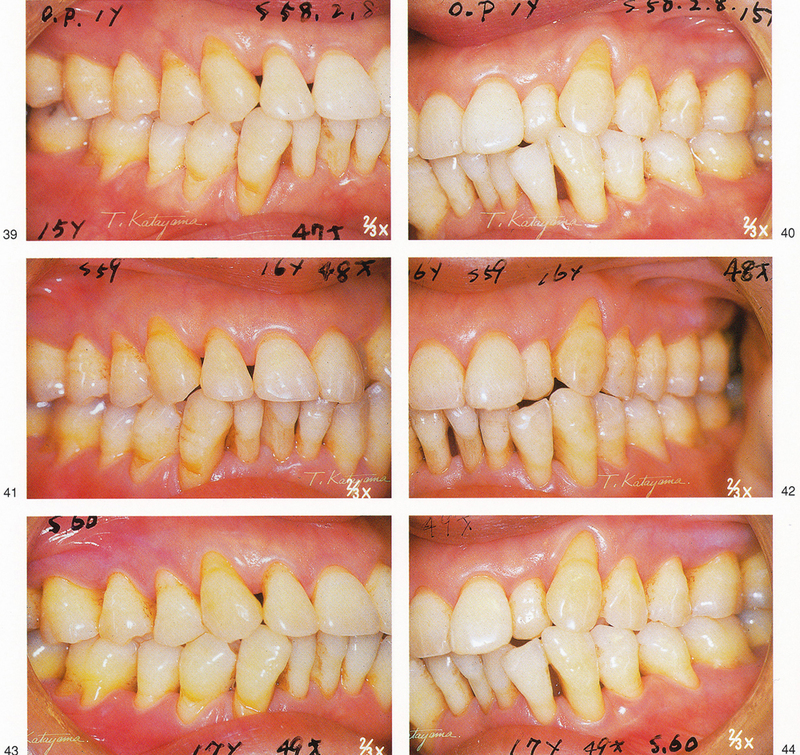 It must be said that it is beyond a range as initial preparation to be going to normalize a state of the original dentition when dentition is already unjust before the onset. However, you should be pushed forward with the understanding of the patient as different curative treatment of the dimensions when this correction is accepted very important for the prevention of the recurrence, a healthy increase. In addition, an occlusal adjustment is the measure that is important as initial preparation, but I want to warn that it causes serious danger to perform this abusively.